To make the marinade combine the yoghurt, paprika, curry powder, salt and pepper to taste in a small bowl. Place the chicken in a zip lock bag and pour in the marinade, coating the chicken thoroughly. Leave in the fridge for at least half an hour to marinate. Place the chicken and excess marinate in an oven proof dish and bake for about 30 minutes or until the chicken is cooked through. Add the green beans, olive oil and lemon juice in a pan and sauté for 10 minutes or until the beans are cooked. Put together the base of the salad by combining the spinach, avocado, red onion and tomatoes. When the beans have cooled add to the salad. 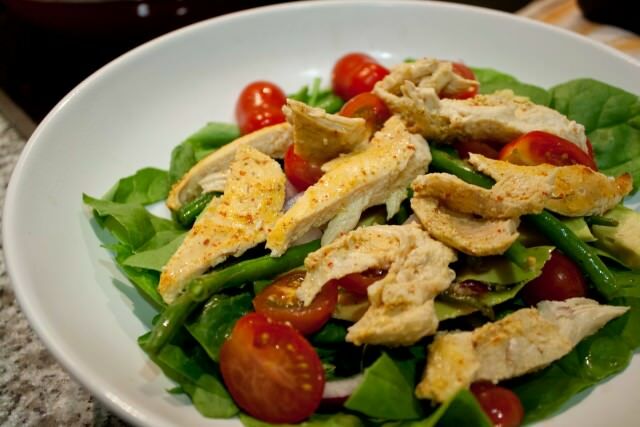 When the chicken is cooked and cooled, slice thinly and add atop the salad. Serve with your choice of sauce or sides.